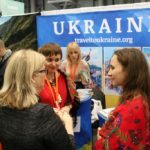 Thousands of visitors had the opportunity to learn about Ukraine at this year’s New York Times Travel Show, held at the Javits Convention Center in New York City during the weekend of January 26-28. This annual event is considered the largest and most prestigious travel trade show in the United States. Over 32,000 visitors and industry professionals attended this year’s show (the largest number since its inception), with 600 exhibiting companies from over 176 countries providing travel and tourism information. 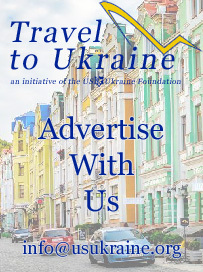 For the second year in a row, the U.S.-Ukraine Foundation has spearheaded the effort to ensure that Ukraine is well-represented as an attractive travel destination.for American tourists attending the show. Appearing under the banner “Travel to Ukraine,” this year’s booth participants included Anton Taranenko and Iryna Dudynska of the Kyiv Tourism Department, Mariana Oleskiv of the Lviv Tourism Office, Vincent Rees and Natalka Makarenko of Cobblestone Freeway Tours, Julia Kulyk and Aleksandr Skrypka of JC Travel Ukraine, and Yaroslav Yemelianenko and Serhiy Myrnyi of Chornobyl Tour. Aleksandr Skrypka and Julia Kulyk of JC Travel Ukraine talk to visitors at the Travel to Ukraine booth. Among the continuous crowd of visitors encircling the Travel to Ukraine booth were several VIP guests. Anna Romanova, a Ukrainian Member of Parliamemt and chair of a parliamentary committee on tourism, dropped by and presented USUF with a beautiful book she authored about her hometown titled Chernihiv: City of Legends. Denys Semenovych, Consul of the Consulate General of Ukraine in New York, also visited the stand, as did Mariya Soroka, President of Razom for Ukraine, a Maidan-born civil society organization that provides assistance to Ukraine. The New Jersey-based Iskra Ukrainian Dance Ensemble treated the audience to a captivating performance of folk dances. Ukraine’s popularity as a tourist destination continues to grow, which has important implications for the country’s further economic development. As reported by Ukrainian media, the number of foreign tourists visiting Kyiv in the past year reached an estimated 1.5 million people, which is nearly double the number seen in 2014. And in another sign of the burgeoning international interest in Ukraine, Lviv airport boosted its travel flow to over one million passengers in 2017, a 46% increase over the previous year, reports UNIAN. The Iskra Ukrainian Dance Ensemble at the New York Times Travel Show. (Photo by Adrian Karmazyn). 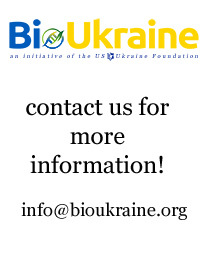 For more information about Ukraine as a travel destination, please visit the U.S.-Ukraine Foundation’s Travel to Ukraine website. 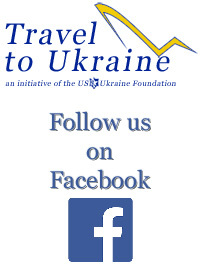 To view a USUF Facebook photo album devoted to the Ukraine booth at the New York Times Travel Show click here. 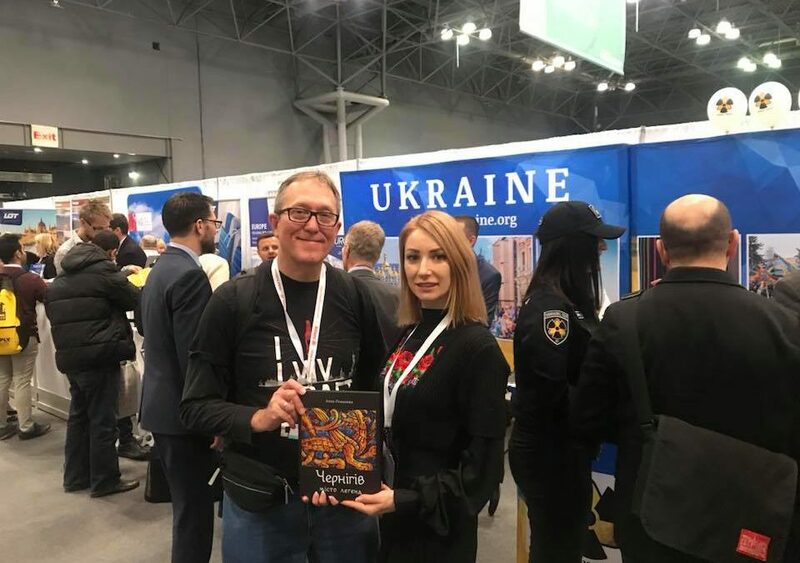 Photo at top of page: Anna Romanova, a Ukrainian Member of Parliament, presents USUF’s Adrian Karmazyn with a copy of her book about Chernihiv during the New York Times Travel Show.